I received some helpful feedback from one of my readers about the article I just posted on Feb. 19th. I went back and read my article and noticed that if taken by itself, it could come across as being rather egotistical. Someone could read this and think, “Gee, this person sounds pretty arrogant.” Now I will admit that I used to be an arrogant person, but I don’t believe that is true anymore today, and I really don’t want any of you to think this about me. Now I believe that the basic facts are there in the stories. One thing I didn’t tell you was that because of me, my Grade 5 teacher had to put a lock on the cabinet for the extra homework sheets. : ) But I did not include those stories just so people could “ohhh” and “ahhh” at me and praise me for how smart I was. There are two main reasons why I included that article in my blog site, and I want to make sure that these two points are clear. First of all, with encouragement from my wife and others, I began last November to write out “my story”. So the last article about my achievements is simply one part of a larger life story. And within the context of my life, there was a time that I pushed myself to be a high achiever and was proud of myself when I got those results. But God has been at work in my heart for a long time now to be more humble in nature, and to give the credit and honour for achievement back to the Lord. Secondly, I am looking at my life now with the advantage of hindsight. As a young man, I thought that I could go out and conquer the world, just like most other young people. And I especially thought at that time what a great thing it was that God had blessed me with a sharp mind. But now in the later part of my life I am seeing this blessing from a completely new angle. The muscle disease which has reshaped my life in so many ways has now shown me how gracious God has been to me. God, who knows all things in advance of when things will occur, He had it in mind all along that I would be engaged in this ministry work of Bible translation. He also knew that I would be hit with this Muscular Myopathy in 2008. Since then, almost all of my major muscles, but primarily my legs, have been affected and have lost significant energy and strength. Thankfully my major internal organs have not been affected at this point. And for the most part, I think I can say that my brain has not been too affected either. And yet, there are times now that I seem to struggle to keep my attention or focus on a task, and after a few hours of doing translation, I find my body and mind can become quite tired. Then I need to rest for an hour or so to get the energy to keep going with the checking sessions. And so I have wondered at times, what would I be like if my mind had not been as strong and as sharp as what God had given to me? Would I have been able to continue doing Bible translation work? But God has been very gracious to me. 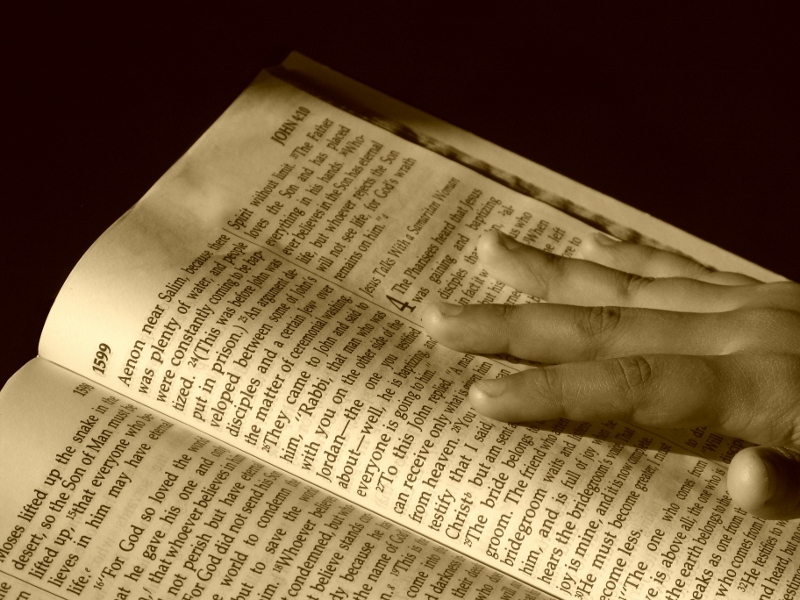 My heart’s desire ever since I was a teenager was to be a Bible translator. It took quite a while before I finally got to the field, but from 1997-2002 our family was able to live in a remote village of Papua New Guinea to learn the language and start translating Scripture into their language. For a family medical reason, we had to leave the field and be in Canada until 2005. Then we spent a year and a half in Africa helping one of our field branches doing administrative support work. So finally I was ready to start doing more translation work in PNG by 2007. I got the training to be a translation consultant, and then my disease hit in 2008. For three years now I have been struggling with the physical limitations of this disease. And there were many moments when I wondered if my work for the Lord was over. But with Jill’s help, and the support of many others, God has been revealing quite clearly to me that He is not finished with me yet and is still able to use me in this important area of translation checking. And I am so thankful that it is for the most part a task that requires mental energy and not too much physical energy. So God in His wisdom gave me a good mind, not so that I would have something to boast about, but He did this in preparation for this time when I would need to have a clear mind to do His work. 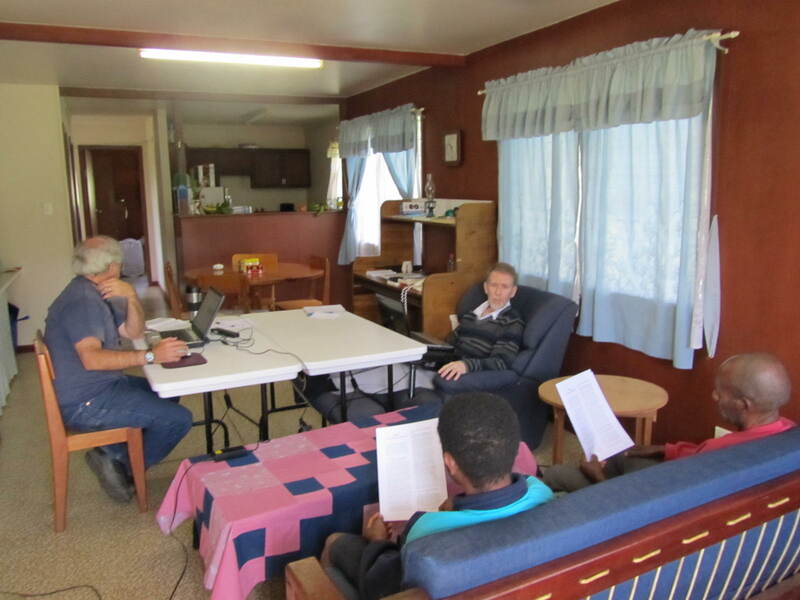 In another article I will tell you all that is involved in doing Bible translation consultant work. But suffice it to say, there are many times when I need to be able to think and talk about Scripture in at least three, and sometimes four different languages. So just like Paul says, “our bodies are wasting away”, so I am learning to live with a disease which is limiting me in the physical realm. But while I am still able to and God gives me the strength, I will commit my body to do the work of God, but even more so I will commit my mind to doing the Lord’s work. 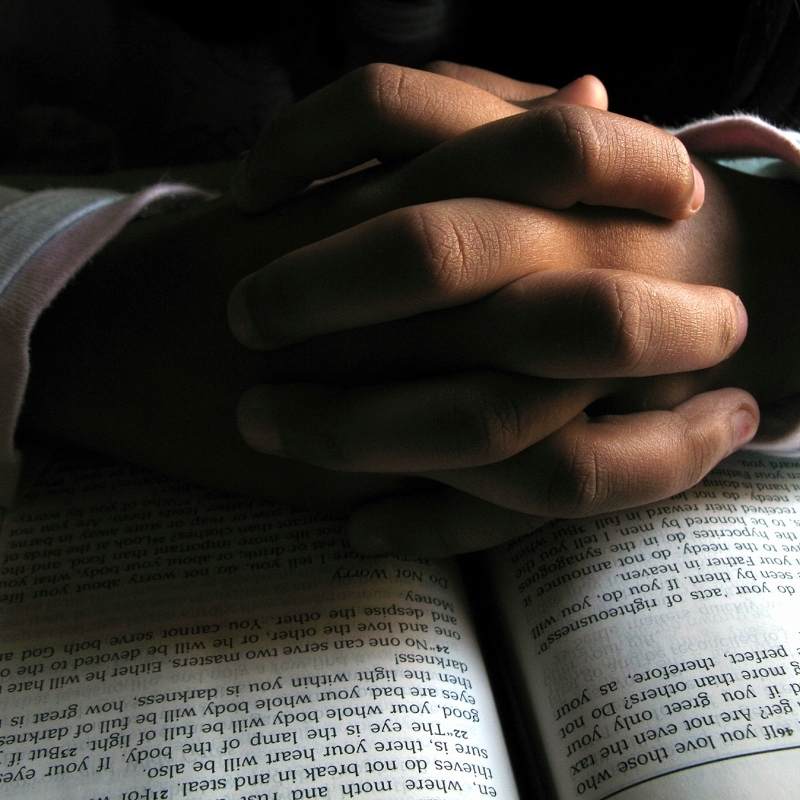 My request is that you would all pray along with me that God would heal my body. But if not, pray even more so that God would protect my mind so that I can continue doing this work for Him for many more years. Until very recently, it seemed to me (and to others) that I was always in school studying something. You could say that I was one of those “perpetual students”. Now that I am more mature (i.e. I am past middle age and heading toward the next category), I am quite content to engage in the work the Lord has given to me to do and not to be too concerned about trying to reach one more academic achievement. But for most of my earlier years of study, I was always pushing myself to get the highest possible grades. I would not let myself be satisfied for anything less than an A if it were possible. I don’t think that I felt any parental pressure to have to be such a high achiever. And even though there were always one or two others at the top of the class to compete with, it was never done out of rivalry or spite. It was simply fun to feel we were in a race that ultimately we all won (i.e. being A+ students). In fact, I viewed school from the very beginning as something “fun” to do. When I finished my homework assignment ahead of time in class, I often went up and asked the teacher for more homework. Why? Because it came to me easily and so it was always fun to find the right answers. One slightly embarrassing story comes from when I was in Grave Five. Math back then, and through all the school years, was my favorite subject. The teacher would hand out new math problem sheets for us to work on in class, and then take home if we didn’t finish them. Well, you can probably guess the first part. I almost always finished the sheets before the end of the class session. So what was a boy like me to do? Well….from my perspective, I did the most logical thing, considering how much I loved to do math problems. The next period after Math was Recess, and all the students and teachers would go out of the school and would be out on the playground area. Yes, you guessed it. As soon as the teacher lest the room, I went over to the cupboard with math supplies and helped myself to as many as I could. Now stop for a minute. I do not want you to think that there was some dark criminal side to me or that I was going to try to steal the answers before an exam. Or that I would pass on the sheets I found and market them on the black market to other under achieving students. No, my whole purpose in stealing the math sheets was simply because I loved math, and I felt the teacher had not given to me a challenge that was big enough for me. A similar situation arose for me in Grade Nine, the final year for our Junior High School (or Middle School). Again, the situation happened in the Math Class. We would be given homework which we could start in class and then finish at home. But for me, I almost always finished the work in class and still had spare time on my hands. It was at that point that I has some options as to what I could do about this situation. And the teacher tried his best to help me grow in my skills in math. He decided to let me go ahead and start into a Grade Ten Calculus and Trigonometry course book that I would basically teach myself in the subject. And yet I still finished the material too fast and did what most young boys did back then. Well, Grade Ten was not must better for me, as I kept catching on so fast to all the materials of all my subjects. The Social Studies teacher finally suggested that I don’t come to class, but instead go find the biggest library in Calgary and spend study time there for 10 weeks. So once I got her permission on the topic, I went out to research it and came back in 10 weeks to do an oral report on what I had studied. And that is what I did. I holed up in the underground “Special Collection Archives” of the Calgary Main Library and made a report on the early explorers who opened up Canada, like the Voyageurs. Pretty cool, eh? Finally, in Grade Ten, I was recommended to attend an experimental school in Calgary. It was an independent studies program. You signed yourself into the school each morning, and then you decided which topic you wanted to study for the day and went to that dept and worked on course modules. I really excelled there and sped through the material so that I did Grade Eleven & Twelve in less than a year and a half. In addition to all this, I made application for and was awarded four major scholarships to University. Two small grants were from the Alberta Govt, one was from the University, and the biggest one was the four-year tuition grant from Texaco, Canada where my father was an accountant. Only 5 of these scholarships go out each year, and I was presented with one of them. And so I end this article with a sense of humility and praise to God for how He made my brain. I offer it back to Him now in my service to Him. May He in all things be given the honor and the praise. It is mid-February and we are in the highlands of Papua New Guinea. In the first two weeks of being here, I have been able to finish the consultant checking of Ephesians, Philippians and Colossians in the T. language. One verse that really created a strong image in our minds of how as Christians we are joined with Christ and together with each other is Ephesians 4:16. Isn’t it wonderful that God’s Word can speak powerfully to any people group in the language of their heart? What a joy to see the Bible come alive to these people of Papua New Guinea. Praise that all the men finished the consultant checking…In addition, just this past weekend I finished writing the scripture use course on unity (a course the T. people have requested). The beauty of it is that there are so many Scriptures from Ephesians, Philippians and Colossians in this course. In these courses, if we do not have a particular verse translated yet, I use the Melanesian Pidgin Bible (a PNG trade language). God’s timing is perfect in having those three books ready and available in Tay to be used in such a practical way (and though I’d like to say we are that organized, we did not plan the prep of the unity course and the completion of those books to coincide ;-)…that was totally a God thing!). The unity course will take place during our visit to the village in March. The next checking session for me will be from Feb. 17-28, when I will work with the missionary and the men from the W. language. Our goal is to finish checking chapters 21 – 28 of the Gospel of Matthew. On the last trip here to PNG, I had worked with the W. language team, but due to some illnesses on the team, and some deaths of people in the village, we had to cut short our checking sessions. Please pray that we will be able to complete the book this time. We have 8 days to do the eight chapters. One of the men who is coming has not been well, so pray for complete healing for him. The missionary’s health has also been challenged for the past few months, so pray for him as well. And as is always our request, pray for the translation to be accurate, to communicate well in the language, and to be natural in terms of how the people use their own language. Thank you for your prayers. I am doing pretty well. Certainly the weather of the PNG Highlands agrees with my body more than the frigid cold temperatures back in Canada. But when I tell people that I function better in warmer climates, often I get the response, “I think that’s true of most people”. : ) At least my pain levels are lower and more tolerable. Please also continue praying for a clear mind and additional strength for the coming days of checking. Looking ahead, on March 1st we will fly to Madang and have a few days break before I will start my third consultant checking session. This time it will be with a missionary woman and her team of the A. language. Pray that the men will be able to get into Madang as at this point there are difficulties with their transportation from bush to town. And for all who have prayed for my wife Jill, she arrived safely here to join me 12 days ago. She has done some language data work during her time here with me. And as always, she is a great help and partner to me. Having her with me is a joy, and she is able to help with so many little things around the house that I am unable to do, especially when I am doing these translation sessions. Thank you for your continued partnership with us as we work among the peoples of Papua New Guinea. This is the symbol that changed my life. As you can see on top, they have a great logo: Training Tomorrow’s Missionary Today. This ministry, Teen Missions International , has literally trained and sent thousands of teenagers around the world to do missionary work. It was the belief of the early founders of TMI, such as Bob & Bernie Bland, Gayle “Widder” Will, and Bob & Betty Lane, along with others, that it was not necessary for young people to finish college before God could use them in His Kingdom Work. And so TMI was born in 1970, and within a couple of years, the first team of a few leaders and about 15-20 teenagers went down to Mexico for a summer and did a construction project to help the local missionaries and nationals living there. And God blessed Teen Missions so much, that by the time I went on my first summer mission with TMI, they were sending out about 50 teams made of up usually 5 leaders and up to 30 teenagers to places of ministry all over the world. It was 1979 when I decided to go on a Teen Missions team. I was only 18 at the time, and I wanted to go on a construction team to Brazil. (You can read about how my faith grew even before I started the trip in the article “God Will Supply.“) As much as the logo mentioned above caught my attention, i.e. “Hey, I’m a teenager and yet I can still go do mission work,” it was their other more famous motto that sold me on wanting to be involved. The motto was, and still is, “Get Dirty For God“. And every teen who went on a team received at least one T-shirt with this motto printed on it and would wear it proudly. Now whether a person who saw this was just curious or possibly offended by this saying, one thing for sure, it caught everyone’s attention. My understanding was that this motto had two mains ideas within it. First, it was saying that there is work for God to be done, and we all must roll up our sleeves and pitch in and get the work done. And then secondly, the isolated locations and the hard work involved in most of the projects resulted in each and everyone getting dirty from head to toe. And as budding and growing Christians, we did not mind “getting dirty for God”, as we saw churches, orphanages, airstrips, etc. been built and lives changed through the evangelistic outreach which TMI also promoted on all of its teams. I need to back up though and tell you more about the beginning of each summer mission experience. 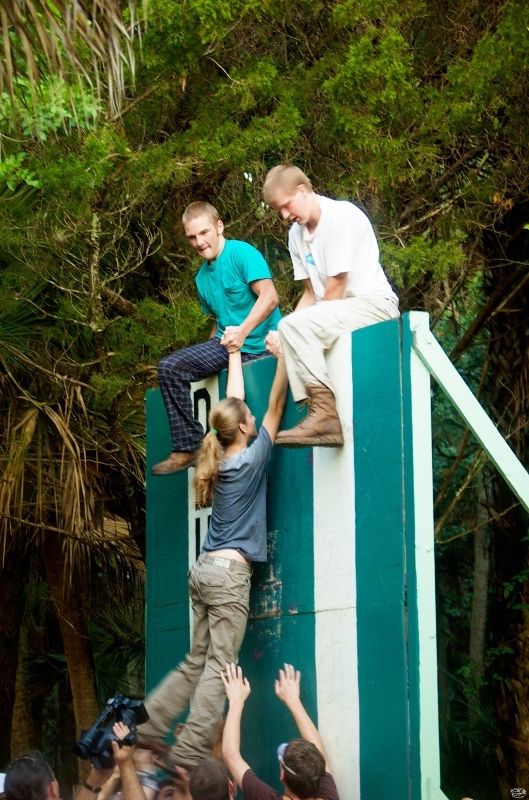 And after you read this part of the story, then you will understand even more how appropriate is their motto, “Get Dirty For God.” Each teenager and leader must first go down to the swamplands of the Florida Everglades and make it through the two week Boot Camp orientation training. Everyone lived in little two-men pup tents in their team designated area of the swampland. That wasn’t too bad….until it rained and soaked everything and everyone. (I actually saw one tent that had been set up on a 4′ x 8′ plywood board float part way though the Boot Camp.) Revile was announced with a bugle over the loud speaker and you immediately got up and got ready to run the obstacle course. There were the tires to jump through (the plagues of Egypt), a mountain of tires to climb (Mt. Sinai), go over a small end of a little lake on a rope netting (crossing the Red Sea), climb straight up and down a rope net that was about 30 feet off the ground (Jacob’s Ladder), swing across a moat, into which many fell in (the Slough of Despond), and other bizarre challenges. The most daunting one was the last one, climbing over the “Walls of Despair”. They were 12 feet high and you had to just use your bodies to get your entire team over the wall. It was to help teach “teamwork”. We found that the Obstacle Course developed team building, team bonding, and trust, as well as got out of shape teenagers back into shape. There were of course many other courses given during these two weeks. We learned how to have a Quiet Time with God, and were taught great spiritual truths by fantastic youth speakers and preachers. The other main things that we learned were specific skills related to the work we would do for the other mission once we got to the field. These included classes like steel tying (to make the reinforcement bars hold a shape until concrete was poured over them). 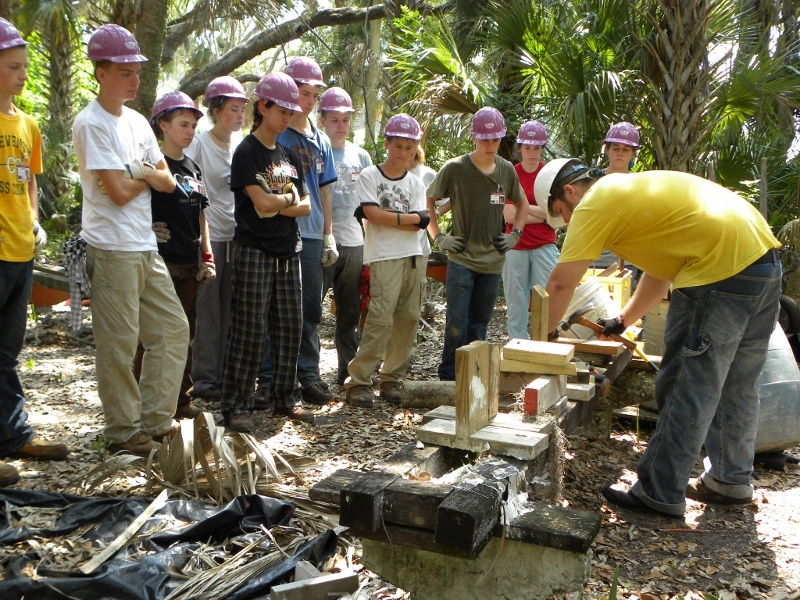 There was also wood-building classes, cement class, and other ones that gave the basic understanding of how to do construction. Probably the most exciting part of Boot Camp was the evening rallies. After we had cleaned up for the day, all the teams and leaders, plus staff members and visiting family would gather under the giant circus big top tent. 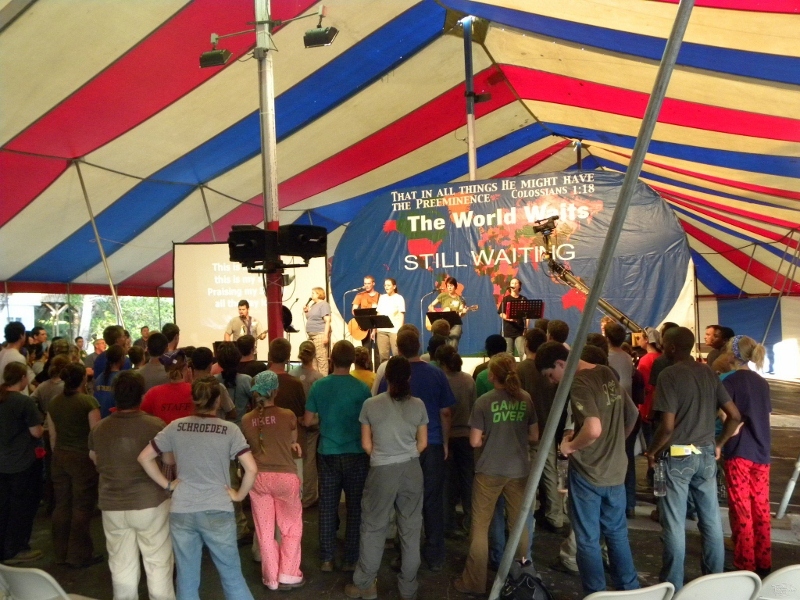 We were able a few times to pack almost 2,000 people in that tent, 1,500 of them being teenagers who were jumping up and down with joy as they worshiped God, and counted down the days until their team would leave and go fly to their country where they would work. I’ll never forget those wonderful days when I was a kid and worked hard, and “got dirty for God”. 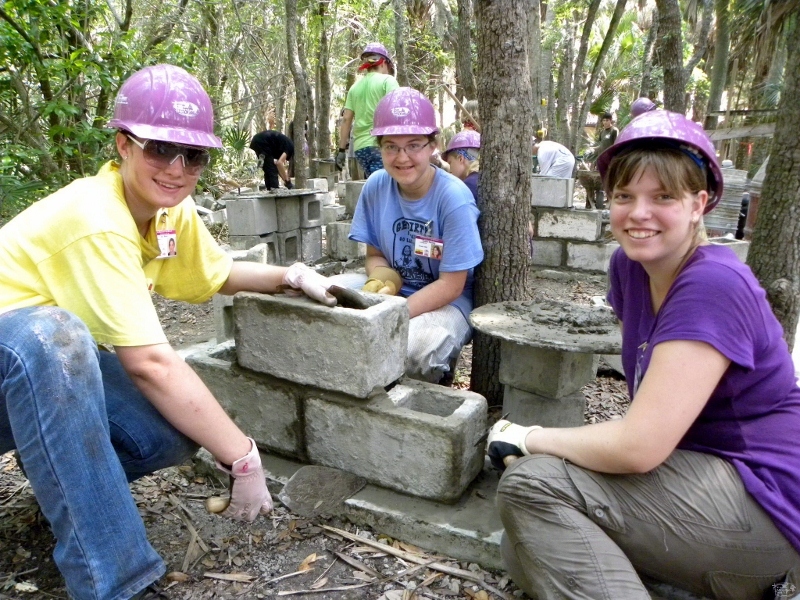 I had the privilege to do this four times: Brazil-Amazon guest house construction in ’79, Honduras-Country hospital wing extension in ’80, Dominican Republic-church building project in ’84, and Mexico-Christian camp expansion project in ’85. What can I say to God except, “Thank You”. Yes, thank you God for granting me these experiences and in each experience I found myself growing more in my faith and in the depth of my understanding of who God is. Those commissioning services that sent us out from the Big Top Tents in Florida truly sent us with the power of God’s Spirit so that we were able to do some great Kingdom work in all different corners of the world. It is this second question which Atteberry now deals with in all the remaining chapters of his book. He gives what he calls “Strategies”, or you could call them road maps, to help you and I get through these difficult times. So if we put aside the “Why” question, then we can focus on “How do we get through this?” But before we look at Chapter Two’s strategy, Atteberry offers us a strong caution which I think we should heed. It is an unfortunate truth that the very time when we need to make good decisions, we often make bad choices. When people, the circumstances of life, or wrong things we do come and hit us and knock us down, we are in pain and we reach out for whatever we think will give us comfort or relief from that pain. And many times, what we think will help us will in the end actually harm us. What does he mean by this? I believe that we all do have something, or should I say Someone, to whom we ought to give our full allegiance. It is God, and His Word contained within the pages of the Bible that will guide us in the path of right living and right choices. And it is when we commit to Him that we will find our path becomes straight and will guard our feet from slipping. This brings to mind for me an experience that could have literally cost me my life. I mentioned in an earlier post (Impacting Others for Jesus) how I went down to South America while being part of the Canadian Navy. When we got to Peru, I asked the Captain for a 3-day leave to visit a missionary couple that lived in the mountain city of Cuzco whom our church supported. Amazingly he granted me my request and so I flew up to visit them. While there, they suggested I take the train to go visit the world-famous ruins of Machu Picchu and I jumped at the opportunity. The train ride was fantastic as we made our way from valley to valley through lush tropical mountainous terrain. Then we took the local shuttle buses up the steep mountainside road which included 13 hairpin curves to get to the actual site of the ruins. I wasn’t part of a tour group, so I used a tourist guidebook to help me traverse the ruins and find out all about its history. What a fabulous day I had climbing in and around the old Incan city. 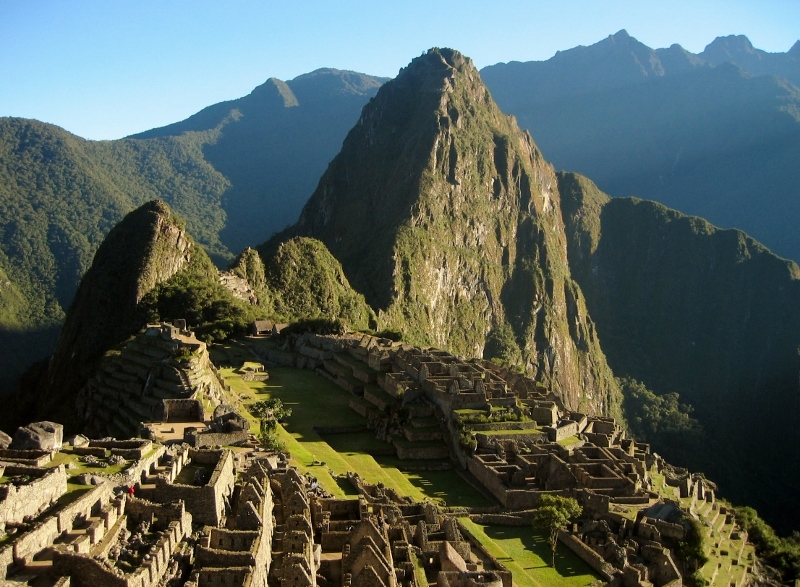 By mid-afternoon I was pretty much done, but then the guidebook told about taking the razor-thin trail from Machu Picchu to its sister peak called Huayna Picchu. You can see in the picture below how steep the sides of the mountains are and how narrow the trail is between them. The guidebook said that it was a difficult climb, but worth the effort. I would have called the climb “dangerous”, but the view from the top was truly spectacular. Then I realized that I would have to hurry to get the last shuttle. Now the guidebook said, “Be careful on the trail, especially on corners.” But I was more concerned about the time than my safety. And at one corner of the descent, I was going a little fast so I put my foot down on the bush at the corner to slow me….but I discovered too late that the bush grew sideways out of the side of the mountain. Suddenly I went out into empty space…..and landed on a flat ledge about 14 feet below. I leaned over and looked at the river which was more than a 1,000 feet below. In my foolishness, I did not listen to the words of caution in the guidebook. And that mistake just about cost me my life. I went more cautiously after that and did catch the last shuttle. So what did I learn from that day? And what am I still trying to learn today? It is important to listen to the words of the Guidebook. And as Christians, we have a special guidebook, the Bible. If we will commit to listening to the message of God’s Word, then we are much more likely to find a straight path out of our current distress. Will you commit along with me to being more obedient listeners to God’s Word? I believe this is how we can lessen the pain and the struggle of our journey in life.